Every health conscious person talks to add muesli to your diet for weight loss but apparently there are lot of Muesli brands to choose in India, where you can end up feeling like a fruit-loop trying to find the best sense of packaging claims. So, I decided to review my personal favorite VLCC slimmers fruit and fiber multi grain muesli. Few months back I was trying out a variety of Muesli brands in the market, what I wanted was one with the most fiber and whole grains but the lowest sugars. One that will fill me up and take me to lunch! 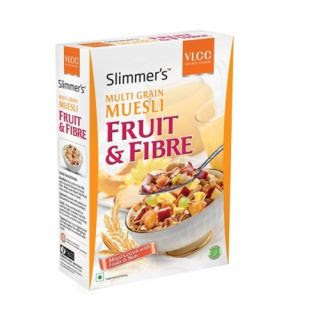 Fortunately I have gotten the privilege to try VLCC slimmers fruit and fiber multi grain muesli and after trying it out for a couple of months, here’s what I have to say about it. I like the packaging with a picture of delicious bowl of multi grains like corn flakes, grapes, apple, and almonds. You will also find a list of the ingredients written on the side which straightaway goes with this Muesli. On the packet opening- I could see corn flakes, almonds, and hearty dash of raisins. I usually eat this Muesli by soaking the contents in hot milk for 5 minutes and joyfully relish on it before I rush for work every morning. It takes only 5 minutes to cook. The mushy flavor of the multi grains in one's mouth is amazing. I really like the mixture of grains and raisins as it gives a decent taste. For the sweet lovers, you guys will need to add more sweetness to it. My mom feels super happy to serve me a bowl of Muesli as she always used to complaint that my diet does not contain any source of protein and fiber, but a single Muesli bowl make her feel as my nutritional deficiency has been met. VLCC slimmers fruit and fiber multi grain muesli is not only incredibly nutritious and delicious, but caters to many essential nutrients. The texture of the Muesli is very light but provide all the majority of nutrients that a body required without additional fats. It is so tasty that sometime in evening I have it as a snack without milk and it keeps me filled. The raisins add an amazing flavor to the muesli giving it a really nice taste. For the fruit lovers, you can also add a mixture of fruits and have a heavy and nutritious breakfast. I am not sure if you can really reduce your weight with its daily consumption but definitely you gonna feel good and happy after eating a healthy meal in the breakfast. High on health and low on fat, favorite VLCC slimmers fruit and fiber multi grain muesli is all natural and a good source of fiber. My only concern is that there is too little in each packet making the number of portions lesser.